Rick - In another message here on the Message Board, I put a SQL Server query and I used the markup toolbar to mark the code snippet as Sql Server. It applied '''sqlserver to the code block, but when I saved the message post, the rendering of the code was all jacked up and not readable. I had to change it to '''foxpro so it would render with a readable colored syntax. 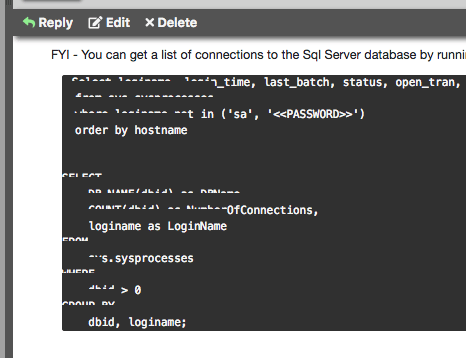 Looks like a bad build of highlightJs that didn't include the SQL Language.